Champions League Wednesday: Who needs to do what? Mathematics can muddle even the sharpest footballing brains - just ask Manuel Pellegrini. Twelve months ago, the Manchester City manager was criticised for apparently not realising one more goal in their 3-2 win at Bayern Munich would have put them top of Group D and pointed towards an easier Champions League last-16 tie. But the Chilean need have no permutation problems this season - thanks to BBC Sport's handy Champions League guide. After Liverpool exited at the group stages, here's what City and the rest need to do to ensure they don't join Brendan Rodgers' men. Manchester City will progress to the last 16 if they beat Roma in Italy and CSKA Moscow fail to defeat group winners Bayern Munich in Germany. 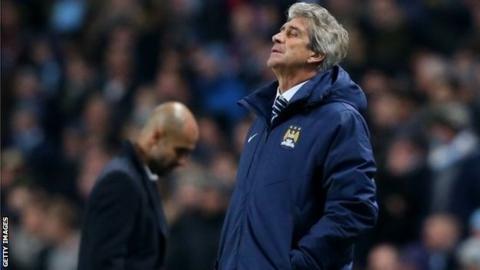 Premier League champions City can still progress if they secure a score draw and CSKA Moscow lose to Bayern. However, if both games end in a draw, then Roma progress. CSKA Moscow must beat Bayern, and hope Roma do not beat City, to qualify. If CSKA and City both win then the Russians will qualify because of their superior head-to-head record. Any of the bottom three sides could finish in the Europa League. Barcelona and Paris St-Germain are already assured of their place in the knockout phase. The pair meet at Barcelona's Nou Camp in their final match to decide who will finish as group winners. A win or draw will see the French champions finish top, but a home win will see five-time European champions Barca overtake them. Dutch champions Ajax know they will finish third with a win or draw against Apoel Nicosia at the Amsterdam Arena and qualify for the Europa League. But the Cypriot side will overtake them with a win. Premier League leaders Chelsea booked their place in the last 16 with a comfortable 5-0 win at German side Schalke in their penultimate group game. That means third-placed Schalke must beat Maribor, and hope Sporting Lisbon lose at Chelsea, to progress. If Schalke win and Sporting draw, then the Portuguese side will qualify courtesy of their superior head-to-head record. Maribor cannot finish in the top two, but would finish third and clinch a Europa League place by beating Schalke. Qualification for the knockout phase has already been settled, with Porto finishing as group winners and Shakhtar Donetsk claiming second place. So the attention turns to the battle for third place. Athletic Bilbao will move into the Europa League if they win or draw their home match against BATE Borisov, who have to win to leapfrog their opponents.